Wildebeest look better in a tophat, or would the pith helmet be more appropriate, conthidering the regional climate? Oh, sorry, some people don't like them... if you believe that "no gnus is good gnus", perhaps you should find another thread. Oh dear goodness! At first I thought it was a typo, but this is infinitely more awesome. I've always picked wildebeests in derby hats myself. Just a personal preference. Hyenas I think are more suited to tophats. And cheetahs in tweed caps, La Contessa says. Having been stalked, at night, by a real live hyena, I must say it was not fun. Don't recall a derby hat, though. Oh, and Miss Adler - wonderful find. I always liked that poster. 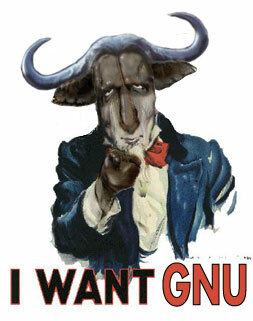 "I’m a Gnu, how do you do? I’ve just moved into the house next door to you. Can I borrow some of that most refreshing brew? I just cannot wait to tell those friends of mine"
Well, to be honest, in my life I have seen more gnus than guns so far. Warning very naughty words ahead! I like Flanders & Swann, but it's a good thing I'm not in an office now: most places disapprove of any sort of gnu-ditty on the web. Large smelly horny...er... Oh dear, Never mind. "Oh, dear. This is all so gnu to me!" This was the fault, of course, of my own dyslexia. I kept reading the "... Guns, Pt. II" thread title this way; so I figured we should really have one for "all them gnus." I had to put it in off-topic, though. 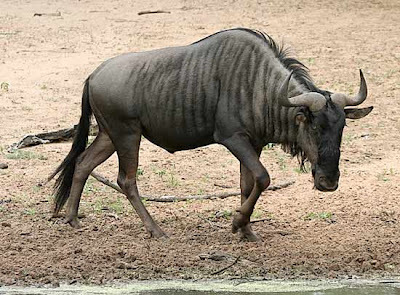 If I had actually made a wildebeest, I could have put it in tactile - or if I had put cannons in a gnu's horns, or some such. "And that was the end of the gnus." I am pleased that you restrained yourself, or I would not be able to mention the new interspecies crossbreed, the "Bad Gnus Bears". somehow I gnu I'd post here again. Hyenas I think are more suited to tophats. Funny; I always pictured them in track suits and Burberry ball caps. Gnus and wildebeeste, of course, should wear fez.